One of the most unpretentious conifers – thuja. Therefore, many growers tend to plant it at home. Knowing the secrets of growing this plant from seed, you can avoid many of the errors associated with this process. Many gardeners practice growing arborvitae from seed. This process is very long due to the slow germination of seed. 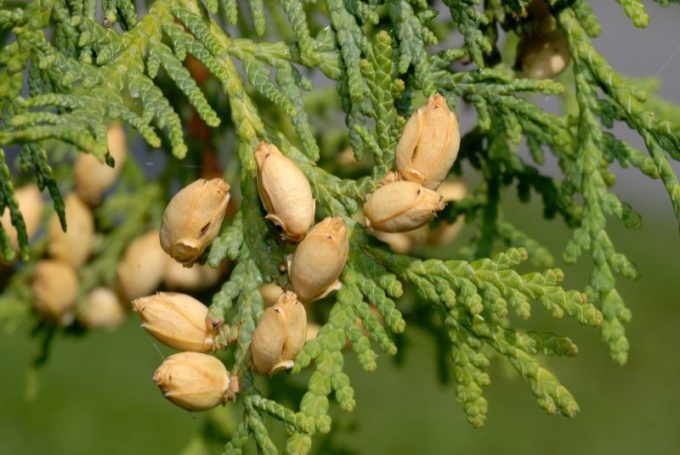 The first step in this case is the acquisition or self-production of seeds of thuja. In the latter case, you will need to stock up on buds of adult plants. You want to pick them in the period from September to December. With the onset of winter cones open and the seeds of them spontaneously fall to the ground, so late December doesn't make sense to stock up on planting material. Finding a good mother plant, you need to carefully cut the bumps, which can be light brown or brown color, and spread them in a thin layer to dry in a place where the temperature does not exceed 7оС. Seeds are removed after the dry flakes. There are two ways of planting arborvitae. The first is the immediate planting of seeds without any pre-treatment or soaking. If the seed has sufficient vitality, will soon appear thin sprouts, resembling the stem of a young dill. The first sprig of arborvitae would give approximately six months, and until that time its growth will be very slow. The second way seed planting provides for the preliminary stratification. For this purpose, the grain is placed in a container filled with damp sand mixed with sawdust. Then the container with the planting closed and set it on the bottom shelf of the refrigerator. Here it should be within 2-3 months. For home growing arborvitae rarely use the second way seed planting, as there is no need in their hardening. The ground for planting is prepared as follows: first, on the bottom of the pot lay drainage. You can use expanded clay, pebbles, coal or other small stones. The thickness of the drainage layer should be 2-3 cm Soil it is best to buy at the store for gardeners. Preference should be given to the soil for conifers. Prepared the ground, slightly compacting, spilling into the pot so that its top is at least 3 cm then the soil is spread thin layer of river sand. If there is no confidence in the quality of the soil, it is possible to pour a disinfecting solution of potassium permanganate dark pink color. Arborvitae seeds spread in a checkerboard pattern at a distance of 1 cm from each other. Grain should not be submerged in soil, tight enough to press them to the ground, which must be moist. Then the pot must be covered with a transparent film or glass and put it in a place where it will have the temperature below 20oC.